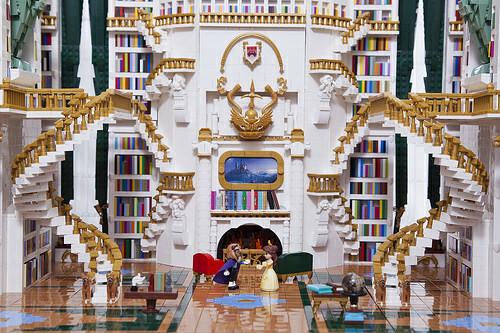 This LEGO re-creation of the library from Disney’s Beauty & The Beast by Sarah von Innerebner isn’t just huge, it’s also stunning. 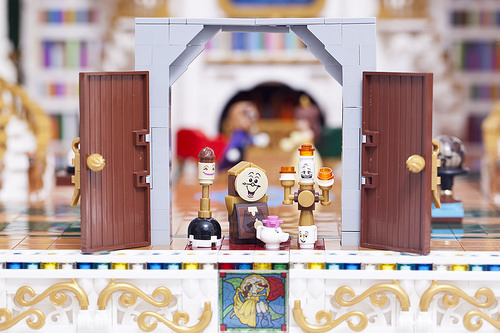 From the soaring spiral stairs, the ornate fireplace, the tall windows and their curtains, through to shelf after shelf of books — the entire model is beautifully crafted, and (from what I remember of the short scene in the movie) wonderfully accurate. At the heart of the scene, Belle and the Beast stand before the fireplace. The predominantly white and gold colour scheme provides a glittering backdrop yet doesn’t overwhelm the details on display. I love the red and green furniture, and the little touches like the writing desk and globe. The tiled floor offers a nice contrast to all the white. The large lion statues at the top of the stairs are nicely done, particularly when you consider the relative lack of pieces in the required sand green colours. 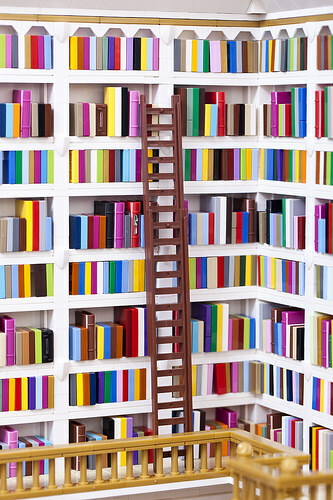 But the dominant design elements here are the bookshelves — row upon row, stacked floor to ceiling. 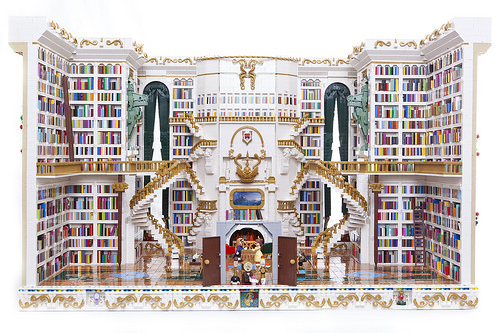 The use of edge-on plates and tiles for books is something we’ve seen before, but rarely at this sort of scale. Whilst many of these will be attached to the shelving, it’s clear from some of the angled ones that they’re not all held in place. I dread to think what happens when Sarah tries to move the model! And speaking of moving it, Sarah tells us she will be displaying the model at BrickCan next weekend, and we can’t wait to see it in person. Dang. There’s some love put into that. OMG, when you said you were looking for books, I didn’t realize THIS was what you were creating. Awesome!